Sorry Mel, here I am taking up space again on your blog – but you talking about a swift put me in mind of this painting. It’s one of those Dutch interiors which used to sell very well all over Europe and the UK, like the Delft crockery which has been judiciously included as one of the props. At that time, people liked story-pictures, preferably with a moral implication, and today we are inclined to shrug our shoulders at the story and look for social history instead. And therein lies a problem. This kind of story is always going to be a bit of a giggle, isn’t it. Father has answered the door. He is head of the household, but he steps back when the urchin says he has been told to hand the letter to the youngest daughter instead. The fun is in people’s reactions; everyone except the cat looks at said daughter. Our little heroine blushes as well she might, because the letter is a billet-doux from a sailor who has just left with the tide: the sea is visible through the door, and the lover is absent. Her friend sniggers, her sister is jealous, and Father is indulgent and bemused. The girls drink tea; is the lover from a tea clipper?
. . . and questions . . .
As with all of these things, the more you look at it, the more questions you find yourself asking. Two of the women are not working; is it a Sunday? And if so, where is the Bible, why is one woman working, and why is Father wearing his working clothes? So it’s not Sunday. According to his costume, Father is perhaps an artisan, or maybe he works on the wharfe in the fishmarket or making blocks and spars. No tools of his trade are visible in the house, so he works elsewhere. If so, why has he been sitting in that now-empty chair and smoking, while it is daylight? 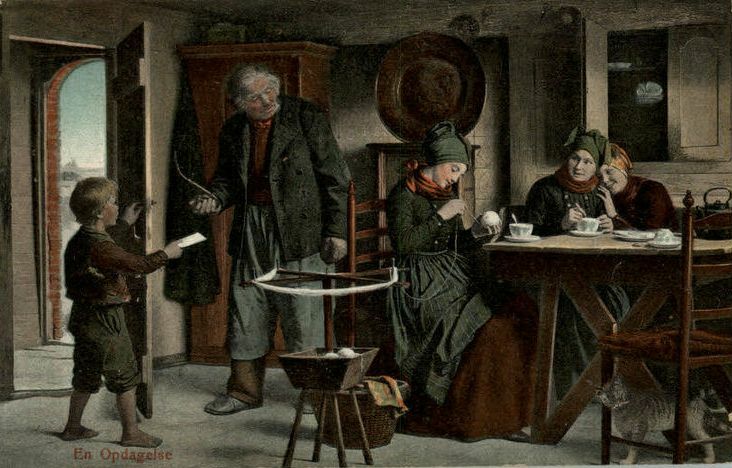 Maybe Father is a prop, made to act like the rich buyers of paintings of Dutch interiors; men who could afford to spend time at home during daylight. Maybe Father has hastily accompanied the urchin to his own home, in the middle of the working day, because he thinks the letter is important? So in that case, what’s with the empty chair, half pulled out from the table? The teacup is unused – although there was a tradition of telling fortunes by swirling remaining tealeaves in the bottom of the cup, inverting the cup on the saucer to remove the last drops of tea, then imagining you could see pictures in the tealeaves now stuck around the inside of the cup. Perhaps the friend was sitting there and telling fortunes, and has now run round to the eldest sister to whisper what she knows about the lovers? Mother is missing, presumed dead – more symbolism for the empty chair – but there are still three cups and four people in the room (urchins don’t count). The room is almost unfurnished by modern standards – a style beloved of the Dutch interior painters, because no clutter means more perspective to show off, and more focus on the actors in the story. In this picture it’s a simple and honest setting for simple and honest folk, but the result is frustratingly that we can’t work out what these girls do for a living. 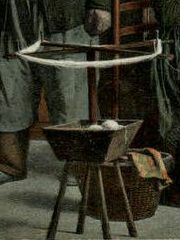 Our heroine winds wool from a peg-swift (yes, we’ve got there at last), but what is she going to do with all that white yarn? There is no sign of needles, hook or loom. Her wool is white; is it symbolism of virginity, therefore purity? White wool was inconvenient to knit with in those days, because steel needles stained it, so you had to use bone needles, if you could get them. Everyone in the picture wears dark-coloured and woven outer garments, which leaves undergarments and baby clothes as targets for the white wool; this is yarn for intimacy and domesticity; private things. If we’re into symbolism, then, is there anything to tell us whether our heroine is as virginal as she is made out to be? She’s cute and fluffy and looks down modestly. Tick. But the cat looks down too, not too cutely, and she has her tail up: a lively cat, maybe? Big sister’s apron covers the whole front of her dress – you can just see that under the table. But little sister’s apron is pulled halfway up; what is that supposed to mean? Is there going to be an embarrassment in her life? The picture appears to show the briefest of moments, but the swift is turning, like time. It’s in the foreground at centre-stage, so take another look at it; what does it remind you of? So there’s really so much scene-setting and story-telling and symbolism there, that there’s not much left for us social history hounds – except the swift. They had jolly good swifts in the Netherlands in the old days, didn’t they, complete with stash boxes, and I wish that one was mine.